Wegmans has arrived in northern New Jersey. Naturally I had to check it out. I got as far as grabbing a coffee before I got back in my car and headed back upstate. Work, after all. 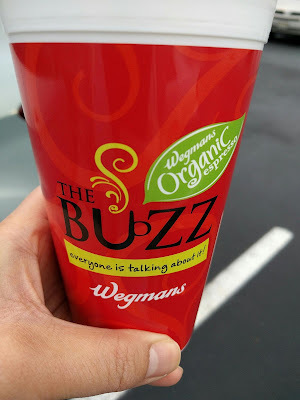 FYI, the reusable cup was $3.04, including tax. Or something like that... three something. They take 50 cents off of refills. Not bad. I'll check it out when I'm down next time. Thanksgiving Eve. There's going to be a Chipotle in the shopping plaza. I am pleased.